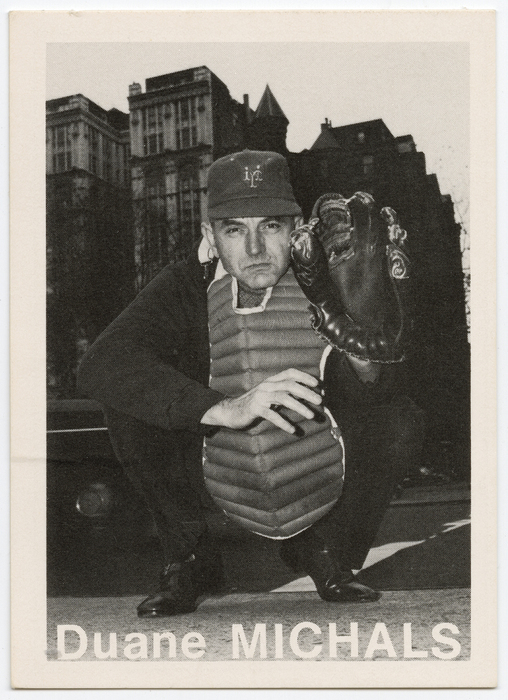 Duane Michals was born in McKeesport, Pennsylvania, and after taking art classes at the Carnegie Institute in Pittsburgh, he attended the University of Denver, where he received his undergraduate degree in 1953. After his military service ended in 1956, Michals moved to New York where he studied at Parsons School of Design and worked as a graphic designer for Dance and Time. A three-week tour of Russia in 1958 with a camera borrowed from a friend marked the beginning of Michals' artistic career, although he still accepted commercial photography assignments. His Russian photographs are portraits, while his images from the mid-1960s catalogue deserted sites in New York. In 1966, Michals started to structure his photographs as multiframe compositions, with subjects enacting set narratives. He began writing captions in the margins of his photographs in 1974, and incorporated painting into his treatment of the printed images in 1979. Books such as Salute, Walt Whitman (1996) veer away from the artist's characteristic interest in issues of mortality and sexual identity, and instead address textual sources for subject matter. Michals received ICP's Infinity Award for Art in 1991. Duane Michals's narrative pieces rely on the sequencing of multiple images to convey a sense of alienation and disequilibrium. In his world, the literal appearance of things is less important than the communication of a concept or story. In his portraiture, however, Michals relies wholly on his subjects' appearance and self-chosen poses to establish their identity; asserting that "we see what we want to see" and that photography is incapable of revealing a person's private nature, he eschews his usual interest in Surrealism, dreams, and nightmares in favor of a more direct approach.